Balloons have been about for centuries. Archimedes, using his famous principle, proposed the use of balloons around 250BC but it is not known if he experimented with this idea. Small hot air balloons were used for open air lighting by the Chinese in 170 AD. In 1513 Leonardo da Vinci also got hot air balloons to fly, probably using cloth impregnated with wax. But the most important year for ballooning was 1783 when three notable events occurred in France. Firstly the brothers, Jacques Étienne and Joseph Michel Montgolfier, sent up a balloon filled with hot air. Then, the first manned balloon ascent was made by the physicist Jean François Pilâtre de Rozier. Finally, the physicist and chemist Jacques Alexandre César Charles released a balloon filled with hydrogen which flew for two hours and covered 43km (27 miles). The first balloon flight from English soil was made on 15 September 1784 by the Italian, Vincenzo Lunardi, launching from Moorfields. The first balloon to cross the English Channel followed just one year later when French balloonist Jean-Pierre Blanchard and American John Jeffries made the historic crossing. English balloonist Charles Green flew with two companions in 1836 from Vauxhall Gardens, London, to Weilburg, Germany, a distance of 480 miles. 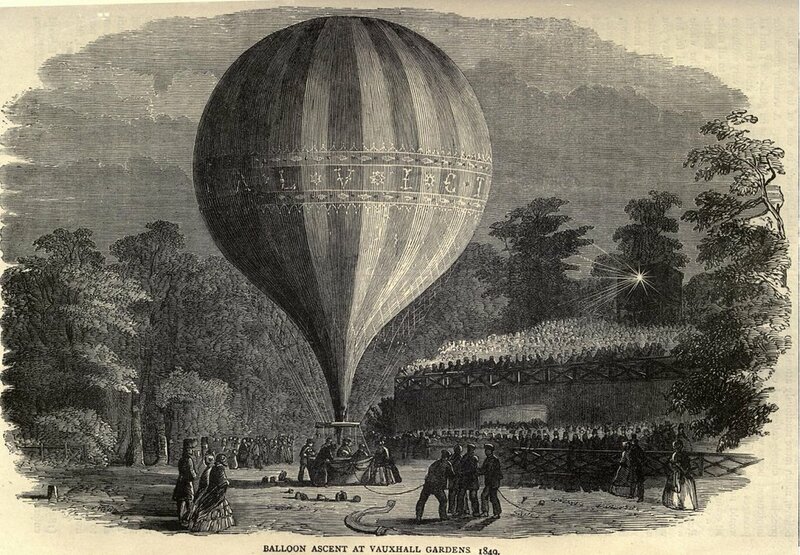 Many balloons were subsequently launched from the famous Vauxhall Gardens. 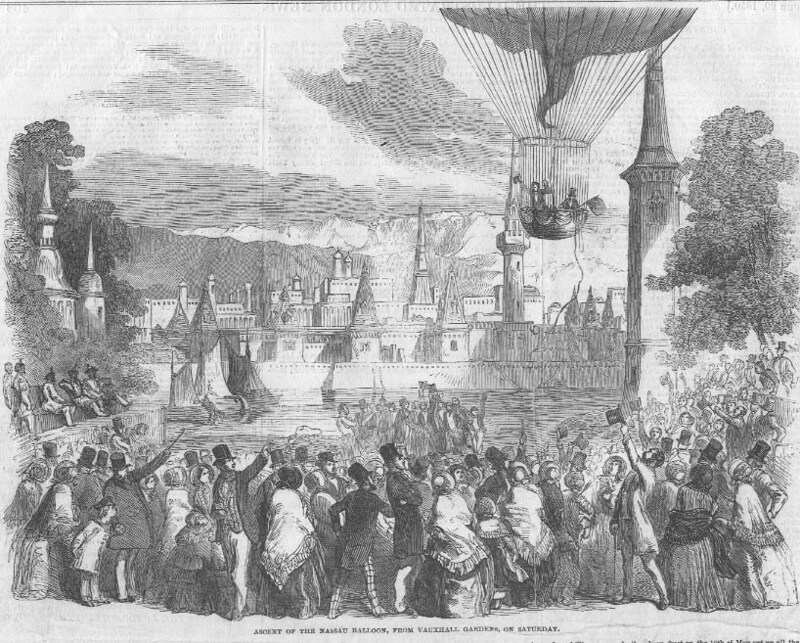 In Sketches by Boz, Dickens said ‘the balloons went up, and the aerial travellers stood up, and the crowd outside roared with delight, and the two gentlemen who had never ascended before tried to wave their flags as if they were not nervous, but held on very fast all the while; and the balloons were wafted gently away…’ Among the passengers to feature in a 1908 photograph of a balloon flight was Charles Rolls, more famous for his cars. St George’s Fields were, until the late 18th century, an area of open and rather marshy ground centred on the present day St George’s Circus. It was bounded approximately by Brook Drive, King Edward Walk, Morley Street, Pocock Street, Great Suffolk Street and Newington Causeway, about 150 acres in all. The swampy nature of the land was a deterrent to the formation of roads, although there were tracks across the Fields from mediaeval times which were passable in dry weather. Parts of the Fields remained under cultivation, using the traditional strip system of agriculture right up till the end of the 18th century, but increasingly the pressure of population in London at that time caused encroachments and enclosures for building and other purposes. The construction of Blackfriars Bridge (1760-69) was followed by the improvement of the south side approaches, carried out by the surveyor Robert Mylne. These developments greatly increased the accessibility of the fields for recreation and amusements. It was here that in June 1785 Letitia Sage became the first English woman to make a balloon ascent. She did so under the guidance of an Italian, Vincent Lunardi, who had become a popular hero the previous year after making the first demonstration of hydrogen ballooning in this country. The balloon itself was made of brightly coloured red, white and blue material and the basket or cage below was equipped (quite uselessly) with steering oars of flimsy wood and feathers. A huge crowd gathered to see the ‘lift-off’, which must have seened every bit as exciting to people of the tire as the first manned space flight did in our own era. 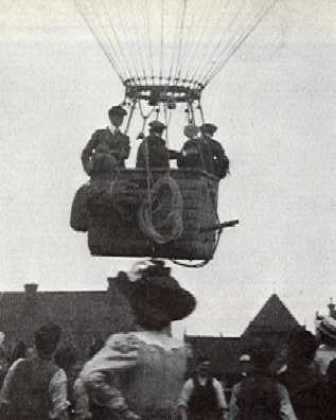 Lunardi had intended to accompany Mrs Sage and his patron George Biggin on the flight, but the weight of all three people (Mrs Sage confessed to a weight of over 14 stone) proved too much for the balloon to lift. Lunardi then suggested that he himself could forego the ascent, and Biggin, with Mrs Sage, who were both completely inexperienced in such matters, took the balloon aloft by themselves. The balloon rose gently at first and was then carried over St James’s Park and Piccadilly, before drifting north-westwards to land about two hours later in some fields near Harrow. On the way the couple enjoyed a lunch of ham and chicken with Italian wine, which Lunardi had thoughtfully provided. The reception at Harrow ”as somewhat mixed: the local farmer was, according to Mrs Sage, ‘abusive and savage to a degree’ but a party of enthusiastic boys from Harrow School also arrived and held the farmer at bay until the aeronauts could depart the scene. Mrs Sage later described her impressions of the flight from St George’s Fields in ‘A Letter to A Female Friend’. This she compiled from notes made at the time, adding that she was ‘Infinitely better pleased than I ever was at any former event of my life’. Ballooning continued to be a popular entertainment well into the 19th century, and many ascents were made, often in highly dangerous circumstances, from the fields around London. The famous Vauxhall Gardens which were originally situated in open country, were at this period increasingly affected by the spread of industrial development; their rural character was lost and the general desirability of the area declined. The traditional musical entertainments of the Gardens had lost their appeal, and the management turned more and more to lurid and spectacular attractions including ballooning to sustain their income. In 1850 the celebrated Mrs Graham became the first woman to make a balloon ascent at night, which she did from Vauxhall Gardens. A contemporary poster, now in the museum of London, advertised the occasion. Mrs Graham and her husband were perhaps the most famous English balloonists in the 19th century, making ascents on many public occasions such as the coronation of Queen Victoria (1838) and during the Great Exhibition of 1851. By the time of Mrs Graham’s night flight from Vauxhall the original St George’s Fields and, indeed, nearly all the land between there and Vauxhall had been built over. With the modern revival of interest in hot air ballooning however, one wonders how long it will be before another ascent from St George’s Fields – or perhaps the Geraldine Mary Harmsworth Park, nearby – will be attempted.